On hiatus for a bit. Had hand renovations on joints and tendons in October, and will have a rotator cuff repair end of November. Out of studio for a while. Article on digital die cutter use in studio, New Tools, New Possibilities in Studio Ceramics, originally published in March 2015 issue of Ceramics Monthly, pages 54-59. http://www.ceramicsmonthly.org . Copyright, The American Ceramic Society. Reprinted with permission. 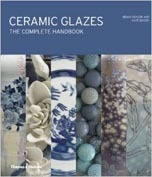 Ceramic Arts Handbook Series: Glazing Techniques. American Ceramic Society. Compliation of articles on glazing. Reprise of The Colorful World of Majolica article. Free 24-page download sample available. When it comes to learning new surface decorating techniques, nothing beats a live demonstration. 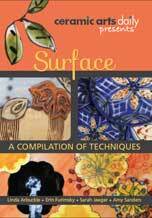 In this new compilation form Ceramic Arts Daily Presents, join Sarah Jaeger, Linda Arbuckle, Amy Sanders and Erin Furimsky as they show you some really cool ways to decorate using a variety of techniques. Gathered from their full-length videos, these robust projects focus on different ways to creatively enhance your surfaces and inspire fresh ideas." 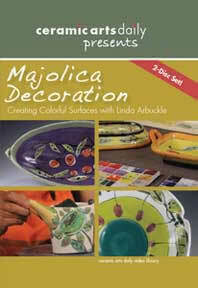 Ceramic Arts Network has my 2-DVD majolica demo. 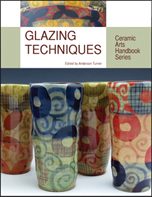 They have posted an excerpt from the DVD about flocculating glaze for better application. One of my favorite visual demos. 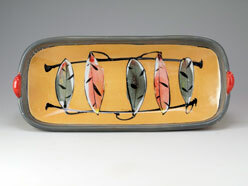 NCECA Spirit of Ceramics, Vol 6, 2011, Linda Arbuckle: Fresh Color on Clay. DVD includes personal background as well as studio demo. Video trailer at the web site. 500 Teapots Volume 2, Lark Books, 2013. Jim Lawton juror. Work pictured. P. 11, 13. Maiolica, Daphne Carnegy, A & C Black, London. Work pictured, cited. 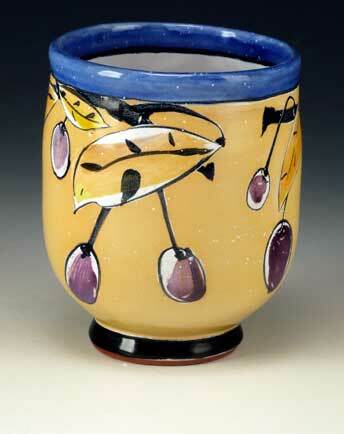 Arbuckle, 2015, Yunomi: Low-hanging Purple Fruit. Majolica on terracotta.